Inspiring quotes and striking images from a variety of outstanding artists make this a wonderful stimulus for discussion and debate about the concept of freedom and what it means around the world. 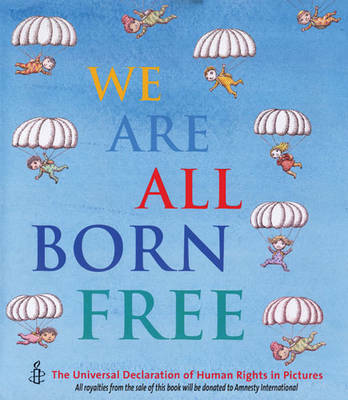 Powerful and moving, this collection of some of the most famous quotes about freedom including the words of Aung San Suu Kyi and Nelson Mandela make thoughtful statements about the global fight for human rights. Illustrators including Chris Riddell, Oliver Jeffers and Shane Evans have contributed stunning illustrations capturing the different ways of being free. I have walked that long road to freedom. I have tried not to falter...I have taken a moment to rest, but I can only rest for a moment, for with freedom come responsibilities. Nelson Mandela If you are tired, keep going. If you are scared, keep going. If you are hungry, keep going. If you want to taste freedom, keep going. Harriet Tubman This inspirational book, following We Are All Born Free, contains 17 quotations about many different aspects of freedom, from the freedom to have an education to that not to be hurt or tortured, the freedom to have a home and the freedom to be yourself. All the chosen quotations are in simple words that can be understood by young children. Authors of the quotations include: Nelson Mandela, Martin Luther King, Harriet Tubman, Anne Frank, the Dalai Lama, Aung San Suu Kyi and Malala Yousafzai. The book is illustrated by internationally acclaimed and award-winning illustrators, including Alexis Deacon, Chris Riddell, Ros Asquith, Jackie Morris and Shirin Adl from the UK, Barroux from France, Roger Mello from Brazil, Birgitta Sif from Iceland, aboriginal artist Sally Morgan from Australia and Mordicai Gerstein from the USA. The cover is illustrated by best-selling author/illustrator Oliver Jeffers. Amnesty International is a worldwide movement of people who campaign for internationally recognised human rights. AI has a varied network of members and supporters around the world. At the latest count, there were more than 2.2 million members, supporters and subscribers in over 150 countries and territories in every region of the world. Although they come from many different backgrounds and have widely different political and religious beliefs, they are united by a determination to work for a world where everyone enjoys human rights.